Today I am sharing another card from Craftin Desert Divas January Release. I have been participating in the Daily Marker 30 Day Challenge and having so much fun coloring these images! This card features the cute little elephant from CDD Up, Up & Away Stamps. I have been having fun with my Zig Clean Color Real Brush Pens lately so I colored my image up with them. You can't tell in the picture but I added some Clear wink of Stella to the ballon for some shimmer. 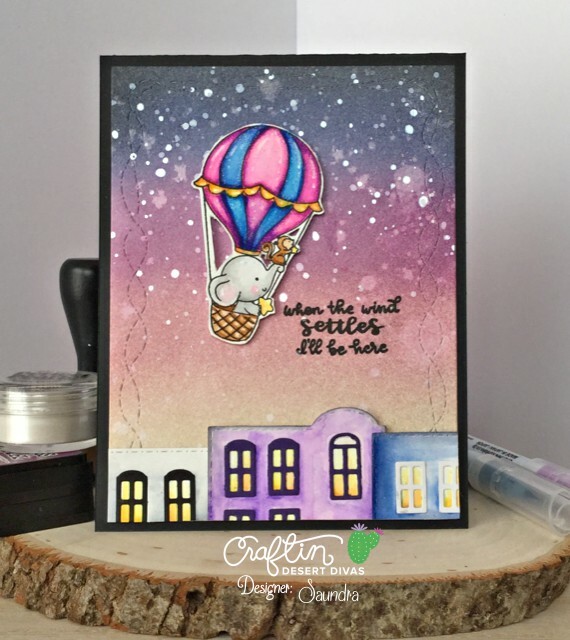 I knew I wanted my little elephant and his friend to be flying above the city and that it needed to be a night sky so I created a background with Ranger Distress Inks. I used the following ink colors: Antique Linen, Victorian Velvet, Seedless Preserves, Chipped Sapphire, and Black Soot. To create the stars, I first added some water droplets and picked those up with a paper towel. Then I mixed some Perfect Pearls with a little water to add some droplets in the sky and to give it some shimmer. To go just one step further, I mixed a little white acrylic paint, more Perfect Pearls, and a tiny bit of water and added it to the sky. Once I was happy with the background I cut my panel with CDD Crazy Stitched Frames Dies. I added my city building across the bottom of my card. These are from CDD Building Dies. I quickly added color with my Zig Pens. 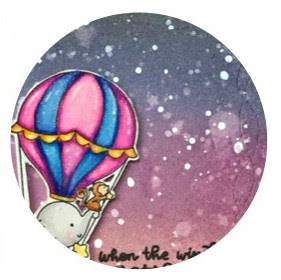 I popped up my balloon and add the sentiment which is included with the Up, Up & Away Stamps.